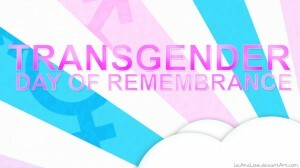 Today is the fourteenth annual International Transgender Day of Remembrance (TDoR). Even with the gains of LGBT individuals this year, there is a startling lack of protection and defense for the basic human rights of trans* individuals in America — or, as Vice President Joe Biden has said, transgender rights are “the civil rights issues of our time.” What can we do beyond memorializing our losses? How do we change a culture of fear to one of empowerment, love, and safety? TDoR is a day to honor trans* and gender non-conforming individuals who lost their lives simply because they were trying to live them; it is a time to raise awareness about the social injustices experienced by trans* and gender non-conforming individuals; but, let’s not forget: it’s also a time to celebrate the joys of living openly. Sign the GLSEN Day of Remembrance Commitment to support trans* and gender non-conforming youth online. Raise awareness about the high rate of violence against trans* individuals. Contribute a post to the Empire State Pride Agenda’s TRANScribe Project. The TRANScribe Project seeks to overcome discrimination by sharing the experiences and stories of trans* and gender non-conforming individuals (as well as their friends, parents, partners, children, neighbors, and coworkers). Learn about the campaign for transgender civil rights in your state. Look into your school or workplace’s non-discrimination policies to see if gender identity and expression are protected. Call out transphobia and cissexism when you see or hear it! Get involved at your local LGBT community center. Rochestarians can visit the Gay Alliance of the Genesee Valley (GAGV). Educate yourself about how law and policy affect trans* individuals. If you are a trans* ally, refresh yourself on how to be a good one. Learn about CeCe McDonald and trans* and gender non-conforming individuals’ experiences within the prison-industrial complex. Syracuse Passes Transgender Nondiscrimination Protections | With a 7-1 vote, the Common Council of Syracuse, New York passed legislation creating nondiscrimination protections for gender identity in employment, housing, and public accommodations. Syracuse was the last major city in the state to add the transgender protections, joining Buffalo, Rochester, Albany, Binghamton, Ithaca, and New York City, as well as Westchester, Suffolk, and Tompkins counties. New York state only provides nondiscrimination protections based on sexual orientation, as the legislature has failed to pass the Gender Expression Non-Discrimination Act (GENDA). With Rochester Trans Group, Genesee Valley Gender Variants, Empire State Pride Agenda, GAGV Youth Group and Rochester SAGE. Acknowledging lives lost while recognizing those living and fighting for equality. Contact Emily1186@rocketmail.com for more information. This entry was posted in Community, National News, News and tagged #civilrights, #genda, #gendernonconforming, #LGBT, #tdor, #trans, #transgender. Bookmark the permalink.